PatchWork works well and is worth every penny of its asking price. Very versatile, handy plugin. Runs VST plugins in non-VST hosts. Latency compensation. We'd prefer to launch VSTs from the menu. 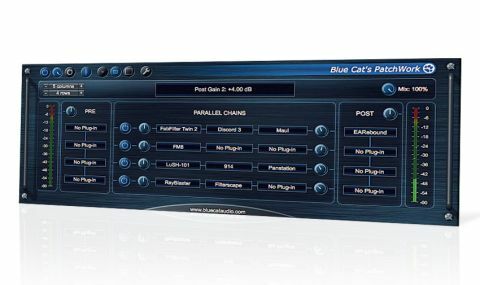 Taking the plugin hosting side of Blue Cat's MB-7 Mixer 2.0 multiband mixer, expanding on it massively and presenting it as a self-contained plugin (VST/AU/RTAS/AAX), PatchWork is a versatile instrument and effects chainer that serves as both a problem-solver and a creative tool. Hosting up to 64 VST effects plugins in one instance (any number of which can be further instances of PatchWork), it centres on a configurable grid of up to eight rows and eight columns, the first column always being a series of Pre effects and the last a series of Post effects. In between them, the rest of the slots make up a stack of Parallel chains, all simultaneously fed by the Pre chain and outputting into the Post chain, which finally arrives at the wet/dry Mix control. "Latency compensation is applied throughout and reported back to the host, so everything stays in sync"
The Pre and Post chains have input and output gain controls respectively, while the Parallel chains all have both. Latency compensation is applied throughout and reported back to the host, so everything stays in sync, no matter how mad your patching gets. When PatchWork is loaded as an instrument, the Pre section becomes redundant, the first slot in each chain hosting an instrument plugin, enabling stacks of up to eight synths/samplers, each running through up to five effects, then the summing Post chain at the end. Should that not be enough, simply load another PatchWork into one of the instrument slots for up to eight more! The problem-solving angle comes from PatchWork's ability to host VST plugins in non-VST hosts like Logic and Pro Tools. We found that this worked brilliantly, despite the odd crash in Logic - likely the DAW's fault, not PatchWork's. It's worth noting that 64-bit hosts still require VST plugins in PatchWork to be 64-bit. Automation and MIDI learn are supported, as is multichannel operation, and overall, PatchWork does exactly what it claims to, offering much, much more full-featured hosting than MB-7. We'd prefer to be launching VST plugins from a menu, rather than spending an extra second or two hitting the Load VST button and browsing for them, and per-slot wet/dry mix could be handy, as could the ability to colour slots for easier visualisation; but such quibbling aside, PatchWork works well and is worth every penny of its asking price.